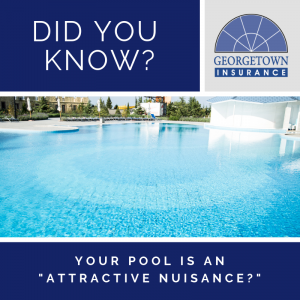 Your insurance company labels your pool as an “attractive nuisance?” Now, you might be scratching your head wondering what that even means. An attractive nuisance is an appealing item that could be a danger to children. Pools, playground equipment, trampolines, lawn mowers, gasoline pumps, abandoned cars, and certain landscaping features such as paths and stairs can look enticing to kids but present a real hazard. Because they increase your liability, attractive nuisances can cause your homeowner’s insurance rates to go up. If you do have these items on your property, it’s important to take the proper precautions and safety measures to ensure children are protected. And if you’re purchasing a property or looking to build or install something that’s considered an attractive nuisance, it’s important that you know exactly what the law states. In any case, it’s a good idea to talk to your insurance agent about your situation and confirm you have the coverage you need.